Thomas Christopher "Chris" Parnell (/pɑːrˈnɛl/; born February 5, 1967) is an American actor, voice artist, comedian and singer. He was a cast member on Saturday Night Live from 1998 to 2006 and played the role of Dr. Leo Spaceman on 30 Rock. In animation, he voices Cyril Figgis on the FX series Archer, Jerry Smith on Adult Swim's Rick and Morty and the narrator on the PBS series WordGirl. He also voices "The Progressive Box" in a series of advertisements by the Progressive Corporation. Parnell was born in Memphis, Tennessee, to a Southern Baptist family. His father, Jack Parnell, was a radio personality in Memphis. He first attended the Southern Baptist Educational Center, and later graduated from Germantown High School. He decided upon acting as a career at age 17, and set his sights on being a theater actor. He attended the University of North Carolina School of the Arts where he received his BFA in Drama. He moved to Houston, Texas after college to do an apprentice actor program for a season at the Alley Theatre, but did not get asked back to join the company. He became momentarily disenchanted with acting, and returned to his hometown and taught high school for a year. He subsequently moved to Los Angeles and auditioned for the Groundlings in 1992. While performing as a company player with the Groundlings for a number of years, Parnell began doing commercials and getting guest roles on various sitcoms, such as Seinfeld and Murphy Brown. He was hired to join the cast of Saturday Night Live as a featured player, and debuted on the show on September 26, 1998. He was promoted to repertory player the following season. In the summer of 2001, because of budget cuts and the hiring of four new cast members, Lorne Michaels was required to dismiss two cast members; he chose to lay off Parnell and Jerry Minor over Horatio Sanz, Rachel Dratch, and Maya Rudolph, but Parnell was rehired in the middle of the next season. While on SNL, Parnell appeared in numerous sketches, and commercial parodies, and performed memorable impressions of various celebrities. Among his notable sketches are "Lazy Sunday", a rap video he shot with Andy Samberg about buying cupcakes and going to see The Chronicles of Narnia, and "More Cowbell". He has also performed raps about hosts Jennifer Garner, Britney Spears, Kirsten Dunst, and Ashton Kutcher. On the DVD commentary for the West Coast version of the 30 Rock episode "Live Show", Tina Fey and Beth McCarthy Miller noted that Parnell was nicknamed "The Ice Man" while working at SNL, because of his apparent immunity to breaking character, citing the "more cowbell" sketch in which he was the only actor not to break. In mid-2006, Michaels announced that four cast members would be laid off due to budget cuts, but he did not say whom. On September 22, 2006, it was announced that three cast members had been laid off: Parnell; Horatio Sanz; and Finesse Mitchell. This effectively made him the only SNL performer to have been released twice by Lorne Michaels, although Parnell did say in a 2008 interview with The Sound Of Young America podcast that he was okay with being let go this time, as he was considering leaving after that season anyway, adding that he probably would have stayed one more season had he been asked back. He had been with SNL for eight seasons; at the time only four people (Darrell Hammond, Tim Meadows, Kevin Nealon, and Al Franken) had been cast members longer. He has since made uncredited cameo appearances on the show, including parodying newscasters Tom Brokaw, Jim Lehrer, and Bob Schieffer. Parnell and his former SNL castmate Horatio Sanz starred together in Big Lake, a 2010 sitcom on Comedy Central from executive producers Will Ferrell and Adam McKay. Parnell voiced Fly in the animated films Hotel Transylvania and Hotel Transylvania 2, and Stan the Fishman in the third film, Hotel Transylvania 3: Summer Vacation. He is a series regular on the FX animated series Archer, and is also known for his guest appearances as Dr. Leo Spaceman on 30 Rock. He also provides the voice of the narrator on the PBS children's series WordGirl. From 2011 to 2014, Parnell co-starred on the ABC comedy series Suburgatory where he played the husband of the character played by his former SNL castmate Ana Gasteyer. His role started out as recurring in the first season but he was bumped up to a series regular in the second season. The series aired for three seasons on ABC. Parnell provides the voice of the "Progressive Box" in commercials for Progressive Insurance. Parnell voices Jerry on the Adult Swim show Rick and Morty. On March 16, 2018, Parnell was cast in the main role of Wayne on the CBS sitcom Happy Together. 1996 Hope and Gloria Howard Episode: "Sit Down, You're Rockin' the Funicular"
1997 Seinfeld NBC Executive Episode: "The Butter Shave"
The Jamie Foxx Show Director Episode: "Do the Write Thing"
Nick Freno: Licensed Teacher Announcer Episode: "The Weighting Game"
1998 Union Square Don Episode: "It Takes a Thief"
Caroline in the City Gene Episode: "Caroline and the Cabbie"
2001 TV Funhouse James Brolin (voice) Episode: "Safari Day"
The Hughleys Rick Episode: "When Darryl Bumped Sally"
Friends Bob Episode: "The One with Rachel's Date"
2002 Ed DJ Curtis Morris Episode: "The Divorce"
2003 As Told by Ginger Additional Voices Episode: "Far from Home"
2010 Better Off Ted Walter Palmer Episode: "The Impertence of Communicationizing"
2011 Robot Chicken Scooter, Major Nelson (voices) Episode: "Big Trouble in Little Clerks 2"
Workaholics Bruce Benson Episode: "In the Line of Getting Fired"
Jon Benjamin Has a Van Area 51 Scientist Episode: "Stardoor"
Love Bites Chad Banks Episode: "Stand and Deliver"
Curb Your Enthusiasm Hank Episode: "The Hero"
T.U.F.F. Puppy The Caped Cod (voice) Episode: "Disobedience School/The Dog Who Cried Fish"
The Tom and Jerry Show Narrator Episode: "Sleep Disorder/Tom's In-Tents Adventure"
Glee Mario Episode: "Opening Night"
Garfunkel and Oates Stan Episode: "Rule 34"
BoJack Horseman Klaus, News Reporter (voices) Episode: "Our A-Story is a 'D' Story"
Bad Judge Douglas Riller Episode: "Pilot"
Benched Mitch Episode: "Campaign Contributions"
Penn Zero: Part-Time Hero Judge (voice) Episode: "Defending the Earth"
Childrens Hospital Ron Pippin Episode: "Five Years Later"
The Adventures of OG Sherlock Kush The Prime Minister (voice) Episode: "The Mystery of the Royal Flasher"
Another Period Dr. Sigmund Freud Episode: "Senate"
Be Cool, Scooby-Doo! Dustin Wallswreath, Jim McCoy, Cop (voices) Episode: "Grand Scam"
Highston Wilbur Liggetts Episode: "Pilot"
2016 Sofia the First Zacharias (voice) Episode: "Her Royal Spyness"
Inside Amy Schumer Michael Episode: "The World's Most Interesting Woman in the World"
Bob's Burgers Warren Fitzgerald (voice) Episode: "Pro Tiki/Con Tiki"
Ask the StoryBots Reindeer (voice) Episode: "Where Does Rain Come From?" Tween Fest Preston Stevens Sr. Episode: "SpurgeExplosion"
Rhett and Link's Buddy System Vice Chairman Episode: "The Magic Is Real"
Samurai Jack Mud Alien, Scientist (voices) Episode: "XCIII"
Black-ish Dean Parker Episode: "Liberal Arts"
Unbreakable Kimmy Schmidt Junior Episode: "Kimmy Pulls Off a Heist!" Great News Gerald Episode: "Squad Feud"
2018 Blaze and the Monster Machines Cousins Ken and Sven (voices) Episode: "The Pickle Family Campout"
2019 Love, Death & Robots The Cat (voice) Episode: "Three Robots"
Miracle Workers God's Dad Episode: "1 Day"
^ Plume, Kenneth (2003-01-21). An Interview with Chris Parnell. tv.ign.com, 21 January 2003. Retrieved on 2014-04-02 from http://tv.ign.com/articles/383/383240p1.html. ^ a b Maron, Marc (2014-10-06). "Episode 539 - Chris Parnell". WTF with Marc Maron. Retrieved 2017-10-11. ^ Graham, Mark (2010-01-14). Archer's Chris Parnell Talks Well-Endowed Cartoon Characters, Being Fired From SNL Twice. vulture.com, 14 January 2010. Retrieved on 2014-04-02 from http://www.vulture.com/2010/01/chris_parnell.html. ^ Keller, Joel (2006-08-22). "Four SNLers are history, says Lorne Michaels". tvsquad.com, 22 August 2006. Retrieved on 2014-04-02 from http://www.tvsquad.com/2006/08/22/four-snlers-are-history-says-lorne-michaels. ^ Stampler, Laura (2012-12-05). "Progressive Almost Made This Box Its Spokesperson Instead Of Flo". Business Insider. Retrieved 2018-01-22. ^ Andreeva, Nellie (March 16, 2018). 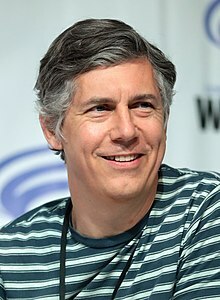 "Chris Parnell To Co-Star In McAuliffe/Earl CBS Comedy Pilot; Phill Lewis To Direct". Deadline Hollywood. Retrieved July 14, 2018.